Okay, so let me reiterate - I really don't give a crap about cupcakes. I'm freakin' sick of them. Wondery why? I've explained it all here(GO #TeamSavarin!!!). That being said, I actually like Sugar Mamma's bakery. I like them for various reasons, and also dislike them for a few, too. But I will go on to explain that later on. First off, their location is nice - right in the hills of Briarcliff off of Mulberry Drive. This is a fun area because it's like Beverly Hills meets The Wild and Wonderful Whites of the Midwest - on the hill is Chanel, where down the hill is patchouli imitation. I love it, to be honest. I love the juxtaposition of Riverside with Red X and the classy Briarcliff Village. I'm probably going to get crap from my boyfriend about what a snob I am for saying such things, but I don't really care because he can be a butthead too. Anyway. So the decor is great, and the staff - at least in my experience - have always been friendly. It's a family-run business, and the people there seem to take it seriously enough, but with that same fun tongue-in-cheek humor that cupcakes have to have. The one thing I love about them is that they have both the regular flavors and their fun off-the-cuff flavors that change. Today, they had a "Taste the Rainbow" cupcake which was vanilla with skittles mixed in. I didn't get that one, but it was extremely tempting. They have everything from a classic Red Velvet to a fun Raspberry Merlot, German Chocolate, or Vanilla Chai. Best part about their cupcake menu is that it is updated just about every day(at least that I've seen) on their website, Sugar Mamma's Bakery.com. Seems like Butterlicious is the favorite flavor of most reviewers I've seen so far on them! (Still haven't tried it yet, though.) In fact, a solid 90% of the people reviewing Sugar Mamma's (both on Urbanspoon and Yelp) seem to love them. Another awesome thing I like about them is that they serve coffee from The Roasterie, which is a wonderful specialty coffee company that's based here in Kansas City. I love it when local things are supported, and you should, too! Read all about them on their website here. Oh, and another cool thing? They have really great ice cream! I even asked where they sourced it - it was a local-ish place, I remember - but I forgot. 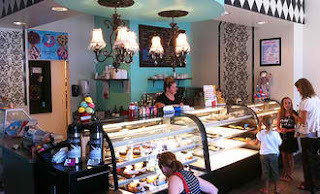 Either way, they have good selections, and are also open much later than other bakeries normally are. When it comes to buttercreams, there are generally four types: American/Common, Italian, French, and Swiss. Swiss, Italian, and French buttercreams are very different from the American buttercream that we are all used to, which is that sickeningly-sweet stuff that we sometimes end up pushing off to the side.With our American buttercream, it's just a crapton of butter and sugar with a pinch of salt and a little flavoring in it. Sometimes you can add an egg yolk for color, or egg whites to 'soften' the buttercream's texture. Most people are super-freaked about the health risks of raw egg product with the FDA and othersuch health departments...but we in the Culinary Field know that things will be refrigerated or sugared and any bacteria will probably be killed in the process. So we're not freaked. Although American buttercreams are fine, they're usually HOLY CRAP sweet. Swiss, French, and Italian buttercreams are sweet but not in an overpowering way. 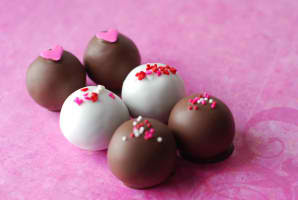 They usually make a textural difference and flavor difference, versus another element of sweet-sweet-sweetie-times. They are buttercreams that are dimensional and interesting, but we Americans like our sweets, for better or worse, so many places just like to stick with the usual Common/American buttercream. So. What does this mean? It means that the frosting is WAY freakin' sweet at Sugar Mamma's, and it's also a bit heavy and thick...but then again, it's an American buttercream. Kind of just the nature of the beast. The flavors of the cupcakes themselves are kind of hit and miss. Sometimes they're really fantastic, and sometimes they're a bit subtle. The raspberry merlot cupcake I had was a bit tough and the ganache was average at best - and they did kind of a poor job coating it, to be honest. Their lemon cupcake with lemon curd was tasty, but the texture of the cake itself left a bit to be desired, as it was a bit inconsistent from top to bottom. The frosting was way too thick and sweet for me, and didn't really taste like lemon at all...just was colored bright yellow. The lemon curd they used was actually fairly good, but tasted kind of pre-made versus a fresh curd. I wouldn't say I like or love Sugar Mamma's bakery, but I definitely don't dislike them. Go check it out for yourself! At very least, go for the coffee - because you know I love coffee.